The two-part winter finale of Brooklyn Nine-Nine was full of touching moments and the usual hilarious hijinks. 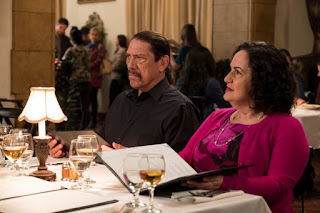 In the last episode, Rosa revealed to Boyle that she’s bisexual. Boyle has managed to keep her secret but Rosa knows it’s only a matter of time before he accidentally reveals what he knows, so she decides to come out to the whole squad. They are super supportive and, of course, also curious about the woman she’s been seeing. Rosa’s not giving up that information yet, though. After telling the team, Rosa approaches Jake privately to ask if it got too touchy-feely with her big reveal. Jake assures her the whole team is still terrified of her so no worries there. As they keep talking, she tells Jake she’s worried about coming out to her parents. They’re very traditional and she doesn’t think they’ll be supportive. Jake encourages her to just be honest with them. Rosa takes Jake out to dinner later that night to thank him for his encouragement. A few minutes in, she admits the real reason she invited him is because she’s going to tell her parents and she needs him there while she does. Jake freaks out because Rosa’s dad really does not like him, but it’s too late. Her parents have arrived! As Rosa starts to tell them, her mom instead guesses that Jake and Rosa are dating. Rosa panics and says yes, that was the big news she had for them. Meanwhile, Holt and Terry head to the Cyber Crimes unit one floor down. Ever since Cyber Crimes moved in, it’s slowed the Nine-Nine’s bandwidth down to a crawl and they want that fixed. Unfortunately, the Cyber Crimes team just laughs and refuses to help. The Nine-Nine regroups and realizes there’s only one person for this job: Gina Linetti. Gina’s been on maternity leave the past few months but they show up at her door to ask for her help. They’re all surprised when Gina refuses, and now they have to resort to plan B. The team buys a large platter of meat to bribe the Cyber Crimes team with, and Amy says she’ll deliver it to them, using her powers flirtation to sweeten the deal. Unfortunately, Amy is terrible at flirting and it absolutely does not work. When she tries to wink, she manages to wink her contact out and Terry has to step in and deliver the meat platter. Cyber Crimes again refuses to help and proceeds to make fun of the Nine-Nine and their lack of knowledge concerning all things internet and bandwidth. All of a sudden, the lights go out and when they come back on Gina is there and drags the Cyber Crimes leader hard. She’s dug up all his secrets and reveals some embarrassing tidbits in front of his team. She says she’ll reveal more if the Nine-Nine doesn’t get their bandwidth back. They finally agree. Back at the restaurant, Rosa and Jake are pretending to be a couple when Amy calls Jake. His phone lights up with their photo with Amy wearing her engagement ring. Rosa’s dad sees the photo and questions Jake about it. Finally, they come clean that Jake and Amy are engaged. Surprisingly, Rosa’s parents say they understand and it’s fine that Rosa is dating an engaged man. Rosa wants to know why they would be cool with that. Her dad says when she asked them to dinner they were just afraid she was going to tell them she’s gay, so her dating an almost-married guy is a relief compared to that. Rosa’s understandably upset by this and admits that she’s bi and storms out. The next morning, Jake catches up with Rosa to see how she’s doing. She says everything’s fine, because her parents texted her after and invited her to their weekly game night like usual. Even though she thinks the invite to game night means they really are cool with her being bi after all, she asks Jake to come with her. He’s not super excited about hanging out with her intimidating father again but agrees so he can be there for her in case anything goes wrong. The rest of the team is celebrating their internet returning to normal, usable speeds. Terry tells Gina that they’ll throw her a pizza party when she officially comes back from maternity leave in two weeks. But then Gina tells them she’s not coming back. She’s decided to start her own company — a sports league for other people’s pets. She does a dramatic exit from the precinct, leaving the team stunned and sad. Later that night, Rosa and Jake attend game night at her parents’ house but it does not go well. Rosa’s parents say they discussed what Rosa told them and they’re fine with it because if she’s bi, then she can still just date men and get married and have kids. Rosa tells them she can still get married and have kids with a woman, but her father says it WILL be with a man because this is just a phase. Rosa’s crushed. She tells them it’s not a phase, she’s known she was bi for a really long time, and the reason she didn’t tell them sooner is because she was afraid they’d react the exact way they just did. He dad asks what it is she wants them to say and Rosa replies that she wants them to say they’ll accept her for who she is. Both her mom and dad remain silent and so she and Jake leave. That same night, Boyle and Amy head to Gina’s house to return the things from her desk and they take the opportunity to try to convince her that she’s indispensable to the Nine-Nine, but she’s firm on her decision. The next morning, Rosa and Jake are at the precinct talking about what happened with her parents when Rosa’s dad shows up. He’s come to say he does accept her for who she is, and he’s sorry he reacted so poorly. He’s going to try to understand and do better and says he loves her no matter what. After they hug, Rosa asks where her mom is. Her dad says she needs a little more time. Rosa says that’s going to make their weekly game nights a little weird, and her dad says maybe it’s better if they stop doing game nights for a while. Rosa says okay but it’s clear she’s upset about it, and the fact her mom won’t accept her for who she is. Meanwhile, Boyle and Terry are training a new assistant to replace Gina when she suddenly appears. She says she’s back and dismisses the poor guy who had just started. Everyone’s glad to see her back, especially Amy and Boyle who take full credit for her return. Just then, Jake walks up and asks what they’re all doing later. That night the whole team shows up at Rosa’s apartment with board games and pizza. Jake tells her that every week they’ll be there for game night. Holt pulls her aside to thank her for coming out. He knows firsthand how hard that can be and wants her to know it does get better. And then it’s time for game night with the Nine-Nine family. In the second episode of the two-part winter finale, Seamus Murphy is back and ready to call in the favor that Holt owes him for his help in getting Jake and Rosa out of jail. Seamus knows Holt is up for the commissioner’s job and is ready to start blackmailing him to get what he wants. It turns out that all Murphy wants is to throw a block party. If Holt helps him do that, Murphy will consider the debt repaid. When Holt tells the rest of the team, Jake is relieved. A block party isn’t even illegal as long as you’ve filed for a permit. Holt doesn’t want to help Murphy, even if it isn’t illegal, because he knows the block party is probably just a cover for something that IS illegal. Jake insists this is great, though, because it’s the loophole they need to capture Murphy. They can help him get his block party permit while also preparing to take him down for whatever else he has planned. All they need to do is become buddies with someone in Murphy’s family who will reveal what’s really going down. And Jake and Boyle have discovered the perfect person: Kyle Murphy. He’s Seamus’s screw-up nephew who is most likely to accidentally reveal the family’s secrets. 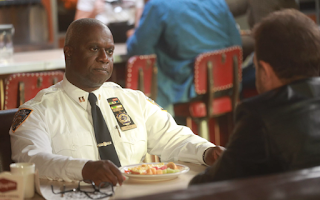 Holt agrees to let Jake and Boyle go undercover. Meanwhile, Amy convinces Rosa to accompany her to “SAPO” — the Street Activity Permit Office — which is the oldest continuously operating permit office in the state. This if, of course, the best assignment ever for nerdy Amy who lives and breathes paperwork. Rosa’s far less excited, but agrees since it’s all to help Holt. While they wait in line at SAPO, Amy tells Rosa how much she loves bureaucracy — it’s elegant and all of the paperwork serves a purpose and fits together seamlessly. Jake and Boyle’s day is going much better. They easily track down Kyle who is an even bigger train wreck than his rap sheet led them to believe. He instantly befriends them and accidentally reveals that he’s part of a crime family. Unfortunately, he’s also been kicked out of the family business for screwing up too many times. The last time he helped on a job he was the getaway driver but left his Uncle Seamus’ car (with the keys in it) so he could go to a movie. When he came back the car, a vintage Rolls Royce, had been stolen, and that was the last straw for Uncle Seamus. Since Kyle isn’t privy to any of the insider info, he’s useless to Jake and Boyle. Unless they can help him redeem himself, which they decide to secretly do. They head back to the precinct and find out the Rolls Royce is in the impound lot. They get it out and park it on the street then proceed to drive Kyle around, hoping he’ll spot it. Kyle is too busy telling them random useless stories to even notice. They drive back and forth multiple times but Kyle still doesn’t notice. Finally, Jake has to shout that it looks like his uncle’s car is parked on the street. Kyle realizes that IS his uncle’s car and gets out and starts to do a victory dance in the middle of the street. He is then promptly hit by a taxi and Jake and Boyle have to rush him to the hospital. Back at the precinct, Gina tells Terry she needs a place to pump. Terry gives her the spare office, much to Hitchcock and Scully’s distress, since they use that as their nap room. They quickly realize, however, that Gina only said she needed a secluded room so she could sneak out of the precinct. Hitchcock and Scully tattle on her to Terry, who wants to know what is going on. He waits for Gina for over an hour before she finally returns. Realizing she’s busted, she comes clean and admits she missed her daughter and went home to see her. Terry admits that it’s hard to be a working parent and he understands. Even though he tells her it doesn’t get any easier, she’s encouraged to know she’s not alone. Meanwhile, Amy and Rosa have their own mystery to unravel. Amy’s feeling super discouraged about the elegance of paperwork actually being a hot mess riddled with errors, when Rosa tells her that because they now know the paperwork is so broken, that means there are even more errors and so they just need to find those and exploit them to their advantage to get the permit. This excites Amy all over again. Rosa has secured every form SAPO has put out over the last 100 years and they proceed to go through them to find a loophole. They find just the loophole to do the trick. There’s an ancient form that was never de-certified. Instead of requesting a block party permit, Amy and Rosa are now submitting a “street closure request for the public humiliation of loose women.” They even pay the fee of one hay penny to expedite processing. And, because the permit has to be submitted by a man (naturally), they’ve brought Hitchcock along. They’ve covered all their bases, exploited the system, and they have their permit! While Amy and Rosa work the paperwork, Jake and Boyle are still working on Kyle. After dropping him at the hospital, they “steal” the Rolls Royce and deliver it to Kyle so he can get back in with the family. They’ve put a bug on the keys so they can overhear Kyle and Seamus’s conversation. Seamus invites Kyle back to the family and they overhear the plan. During the block party, Seamus plans to steal $20 million from an armored truck that has to be rerouted down an abandoned alley due to the party. The team is able to change the truck’s schedule and when Murphy’s team breaks in, it’s empty. Murphy, who’s unaware of what’s going down since he’s attending his block party, hands over the tape of his and Holt’s conversation to Holt, thus releasing him from the blackmail deal. Unfortunately, when Seamus finds out about the armored truck screw up, he blames Kyle. Jake overhears him on the bug saying he’s going to teach Kyle a lesson. Jake and Holt get Kyle arrested on unpaid parking tickets so they can put him in protective custody. Later, Seamus approaches Holt and says he knows what they did. Because they messed with his family, he’s going to mess with Holt’s. He threatens Holt’s husband, Kevin, and then walks away. And that’s the winter finale, folks!